How do you get more customer reviews? The easy answer is to ask for them. Actually soliciting those reviews, however, can be time consuming unless you take steps to automate the process. Automating your customer review solicitation program helps you more easily and quickly build your reputation with social proof. In our world of ever-increasing connectivity, your prospects are spending more time reading reviews and listening to others and less time evaluating your product or service on your website or with the help of your salespeople. And one of the best ways to shine above the competition is to stand out in the review engines. This do-it-yourself guide will help you set up an automated review system to increase your exposure on the most important websites, such as Google and Facebook. If you know HTML and CSS and have a good email sending provider or marketing automation tool already set up for your organization, then getting an automated review system set up will only take an hour or two. Before we get started, it’s important that you have a good understanding of how this automated review system is going to work. If your company operates in a competitive space, then you may already have competitors with a lot of reviews on Google, Facebook, Yelp, etc. If you do, you’re probably wondering how they are getting all those reviews? 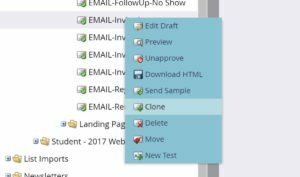 For this example, I’ll be using Marketo as the marketing automation system, though almost all the email solutions out there handle this step in the same way. First, find an email that has a template you already like and think will work well for your review. Clone that email. Next, clear out all the existing content and write a new message that thanks the customer for their purchase and asks them to leave a review. 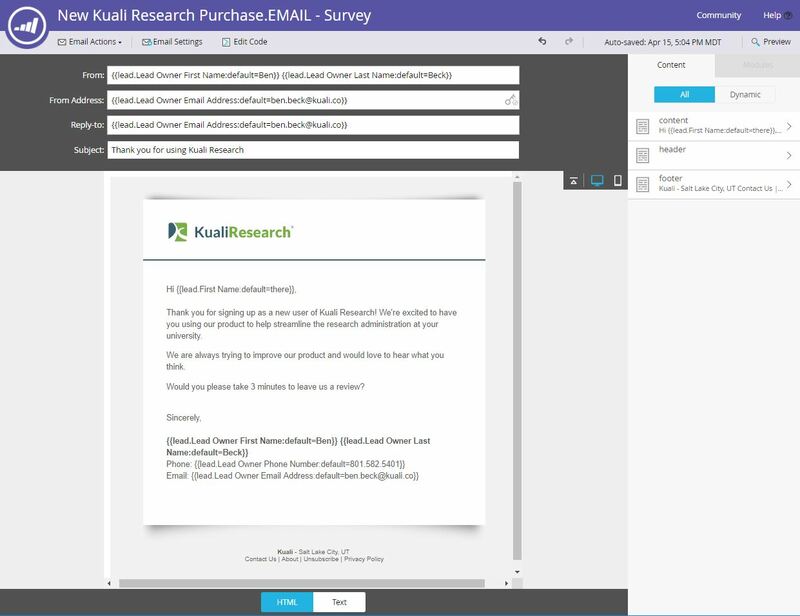 In my example below that I built for my main employer, Kuali, you’ll see that we’re requesting feedback on our Kuali Research product. Feel free to use the content below for your own inspiration. One important “asking a favor” best practice that you’ll see I used here is to explicitly tell your benefactor how long it will take them to help you – in this case, 3 minutes. Be sure to use an image that fits the theme of your brand and email template. Use an image that is colored gray – to indicate that it hasn’t had action taken on it yet. In the case of star rating icons, if you use stars already colored in gold then it indicates five stars have already been ranked for the product. Using gray stars, instead, shows that the customer can click on the stars to leave their own rating. Now you’ll need to build the underlying HTML that handles the redirection. That sounds harder than it is. In fact, I include some sample HTML below that you can easily use in your own email. In the below example, you’ll see that I’ve used the 75 x 75 pixel sized star (the middle size above) because that, with sufficient padding around each star, makes it take up the majority of the template width. It also looks good on mobile devices and is easy for fingers to easily click on one of the stars. I’ve linked stars one, two and three to a form where disgruntled customers can leave feedback. This is important because you need to be gathering this feedback and closely evaluating it. If you’re seeing more people clicking through stars one through three you know you’ve got a problem and really need to take their feedback into consideration. I’ve linked star four to Facebook reviews, though you can link this to any location you’d like. My thought is this – getting reviews on Facebook is important, but not as important as Google where there is considerably more SEO impact. I’ve linked star five to Google reviews – the grandaddy location for most companies. You should closely evaluate where your buyers are researching your product and drive these customers to that location. The last step of getting more reviews is turning on the email and getting it in front of your customers! If you run a SaaS company then this is an easy step. Simply tie your email sending platform (MailChimp, Marketo, Hubspot, etc) into your customer relationship management tool (SalesForce, SugarCRM, Hubspot CRM, etc) and send all new customers into the email tool. Be sure to set up an appropriate delay step in the automated email send. For example, if a customer just purchased a widget from your website make sure you give them sufficient time for to receive the widget and get to try it out before asking them for a review. You’re now well on your way to gaining valuable business insights, better understanding what your customers really want, and getting reviews on the web that will help you get more customers. Please comment below to share how you anticipate using this review system for your business.